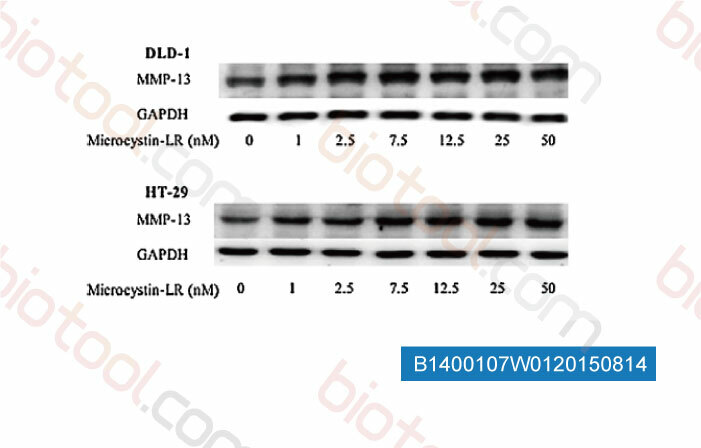 Increase of MMP-13 expression by Microcystin-LR in DLD-1 and HT-29 cells. After 48 h culture with microcystin-LR, the cells were treated with RIPA lysis buffer with 1mMphenylmethylsulfonyl fluoride and protease inhibitor cocktail and the total cellular protein (40 mg/lane) was used for Western blot with a specific anti-MMP-13 antibody. The membrane was probed with an anti-GAPDH antibody to confirm equal loading. In search for better protection for PARP, we found that Bimake protease inhibitor cocktail performed best. 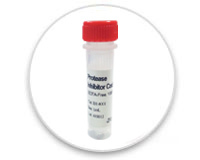 Bimake Protease Inhibitor Cocktail provides protein stabilization for your protein of interest. 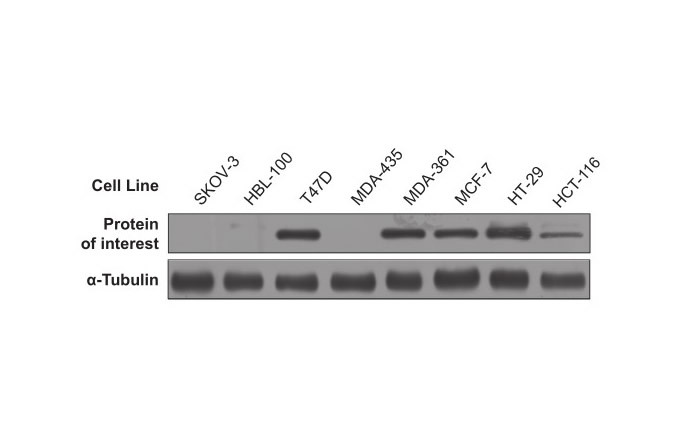 Low-expression of protein in HCT-116 cells can also be detected clearly. 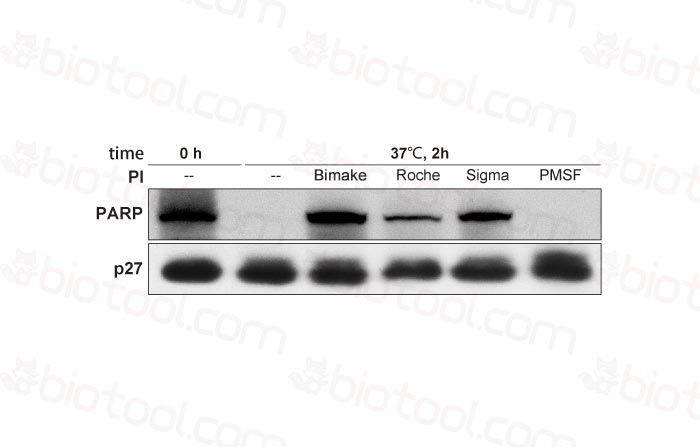 We switched to Bimake protease inhibitor cocktail – it works as well at half the price. 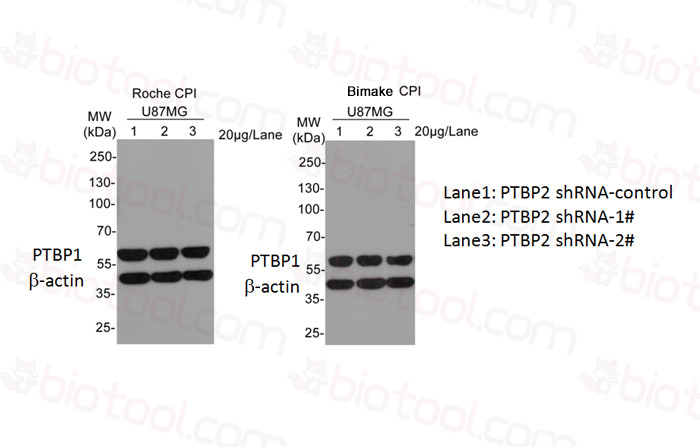 Bimake protease inhibitor cocktail provides the best protection for β-catenin,while Roche tablet performs poorly. 注意点: 传统的蛋白酶抑制剂(E-64, AEBSF, bestatin, leupeptin and aprotinin)是不能够抑制某些去泛素化(DUB)蛋白酶(例如ATAXIN-3)的功能的。(参考文献: Neil D. Rawlings, Guy Salvesen et al. Handbook of Proteolytic Enzymes,Vol.1, 2012). 沪ICP备14029476号-1© Copyright 2013 Bimake.cn All Rights Reserved.